It has taken me a while to get around to this report, as it just made me mad to even think about the injustice of it all. Saints achieved their usual trick of dominating the game and then retreating into a defensive shell. Even so, they were well on course to take a much needed away win when, deep into time added on, Doucouré was allowed too much time and space and simply bundled the ball into the net, past McCarthy with his right hand. The referee, Roger East, was unsighted and the line judge didn't see it either. This was bad enough, but it coincided with the weekend when the Video Assistant Referee (VAR for short) system was used for the first time in the UK, just not in the Premier League and not in this match. TV replays showed the hand ball and on BBC Final Score pundit Kevin Kilbane described it as "clear handball". "He's got his hand up by his head - it's as clear a handball as you're ever likely to see. It's a disgrace, an absolute disgrace. Southampton desperately needed this win, and they have been robbed. It's really poor." But, enough of that, back to the start. Saints team was a strong one, with a back five of McCarthy, Cédric, Stephens, Hoedt and Bertrand. The midfield was Romeu, Højbjerg and Davis, with Ward-Prowse and Tadić out wide and Long as the sole striker. This line-up should have been enough to see off a very poor Watford side, who seem shorn of confidence at the moment. Initially it looked as if things were going to go that way, as Saints took complete control once Ward-Prowse had scored from a Shane Long cut back in the 20th minute. Long was outstanding in this match and did everything but score himself. It got worse for Watford, when Ward-Prowse scored his second of the match just before half-time. Yet again, it was Shane Long's running that created the opportunity. From the left wing Long found Tadić on the edge of the penalty area, who threaded the ball through to Ward-Prowse and he put the ball beyond the Watford goalie. 2-0 and cruising, what could possibly go wrong? At the start of the second half Deeney came on for the home side and Saints seemed unable to respond in any way, other than to retreat into their defensive shell. The team retreated further and further, which as we all know by now, simply means that the other team have all the time and space they need. The home side pulled a goal back in the 58th minute, when McCarthy could only push a shot onto the crossbar and Andre Grey was on hand to head home the rebound. To be honest, it was deserved on the balance of play in the second half, but I still felt it was little more than a consolation goal. Shortly after this Davis was replaced by Lemina, but as in so many other matches this season, it did nothing to change the course of the match. 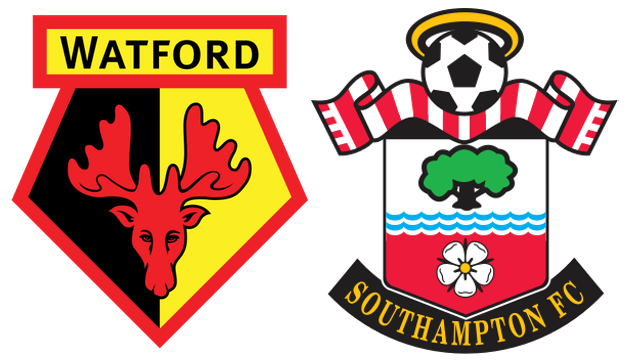 Mauricio Pellegrino did change Ward-Prowse for Sims and Tadić for Boufal, but not until after the second Watford goal. To little, too late. The so called 'equaliser' was an outrageous travesty, but to a certain extent, Saints were the architects of their own downfall. So, that was another two points lost, a draw snatched from the jaws of victory. Will we come to rue those two points, come the end of the season? It may seem odd, given James Ward-Prowse' two goals, but I am going to give MoM to Shane Long, who was simply outstanding in this match. How he has managed to score so few goals himself remains a mystery. Doucouré scored a blatantly obvious 'goal' with his hand in the 90th minute.